A fire has dealt a devastating blow to a well-known Canadian monster truck team. Kathy Wills and her husband Ged Barcroft of the Sheer Insanity Monster Truck from Medicine Hat were woken up Tuesday by their dog barking alerting them to the blaze. They lost the shop, tools, personal vehicles and two monster trucks. The Sheer Insanity team travels across North America performing. In 2010, the pair were awarded Monster Jam titles. “There are going to be a lot of kids that will be devastated. We have a lot of kids that come to every show,” Kelly Matsen-Zora, an employee with Sheer Insanity, said. Wills is the only female Canadian driver who is an owner-operator. 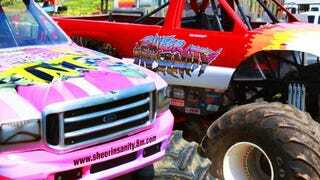 Her bright pink truck is a show of support for breast cancer awareness. The building and most of its contents should be covered but Wills said insurance does not cover the two monster trucks. “You can’t insure monster trucks,” Wills said. Wills said most heartbreaking of all is the couple lost two family pets. “I have two shop cats that have been in our shop since the day that we bought the property that we adopted from the SPCA and I don’t think that they made it out,” Wills said. The fire is not believed to be suspicious but there’s no word on how it started. A fire has dealt a devastating blow to a Canadian monster truck team.